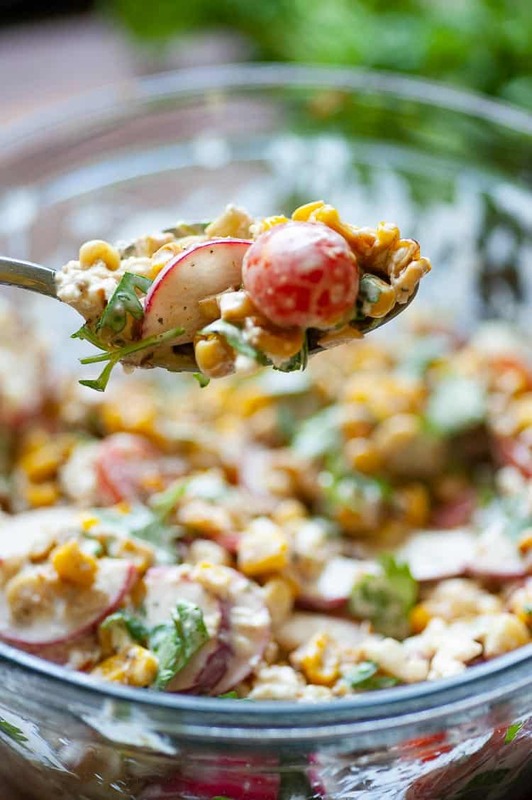 This amazingly good Mexican street corn salad is a perfect summer side dish. The char grilled corn and vegetables get topped with a simple, spicy dressing. Raise your hand if you love easy….tasty….spicy….summertime side dishes. I think I see them all in the air. And I’m right there with ya’. Easy: Like 30 minutes to make. Tasty: Mayonnaise, sour cream and lime juice…’nuff said…Yum. Spicy: Throw in a good amount of cayenne pepper and you can feel it all down your throat. I’d love to take the credit for this recipe, it is so good. It’s actually from Mario Batali from “The Chew.” Too bad that ‘The Chew’ got taken off the air. 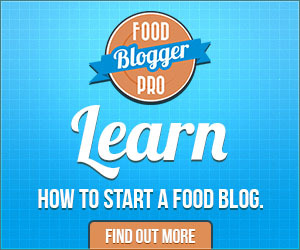 We all need that hands on, how-to-do-it food programming, ever since Food Network pretty much relegates it’s airtime to game shows now. Bring Back Emeril! Okay, don’t get me started! I used frozen, baby sweet corn to make the salad. You could also use fresh sweet corn, 5 or 6 ears, and strip the kernels with a sharp knife. 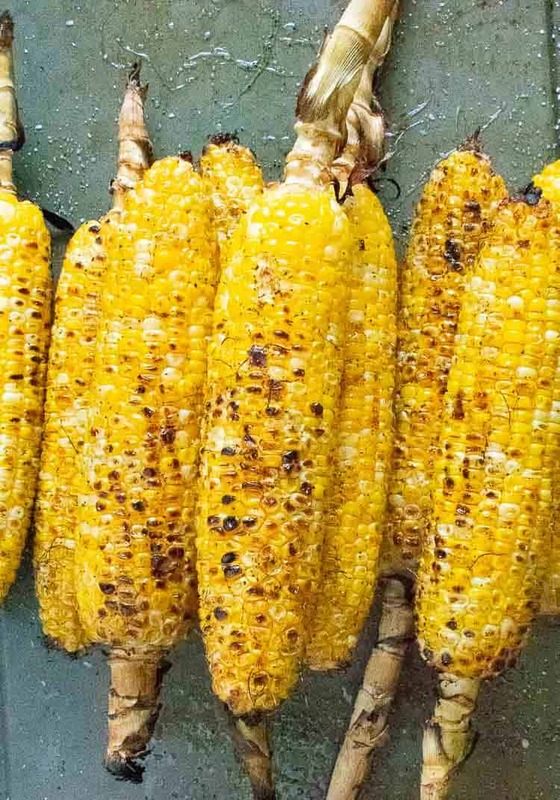 Otherwise, if you have a grill going, you could grill the corn first and then strip the kernels from the ear. 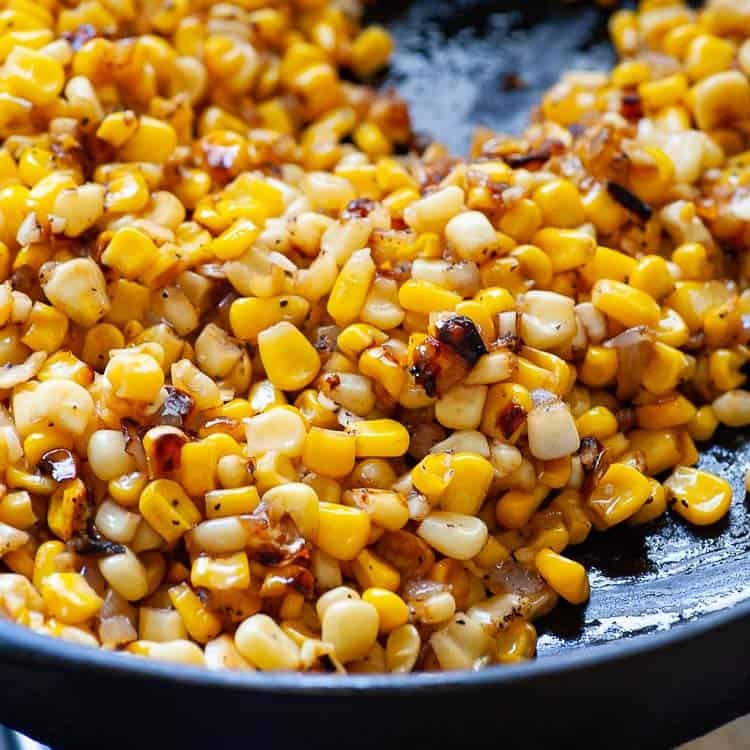 Either frozen and fresh corn takes about 15 minutes to get a good char on it in a hot, cast iron skillet. Totally your choice. Put the corn in a large bowl and let it cool down a bit, then add the sliced radishes, halved grape tomatoes, and cilantro. While you’re waiting for the corn to cool down, mix up the dressing. When you make the dressing you really don’t need to measure exact amounts of mayo and sour cream. Just spoon in what seems like a half cup of mayonnaise and a quarter cup of sour cream. Add the zest and juice of one lime and a little salt and pepper to taste. I did measure the cayenne pepper…exactly 1/2 teaspoon. Whisk this all together then pour it over the corn and fold in to combine. Top this with crumbled cotija or feta cheese. You can serve this warm or at room temperature. Make sure you have a little extra cheese and cilantro to pass if desired. That’s it. Easy and so summertime fresh tasting. 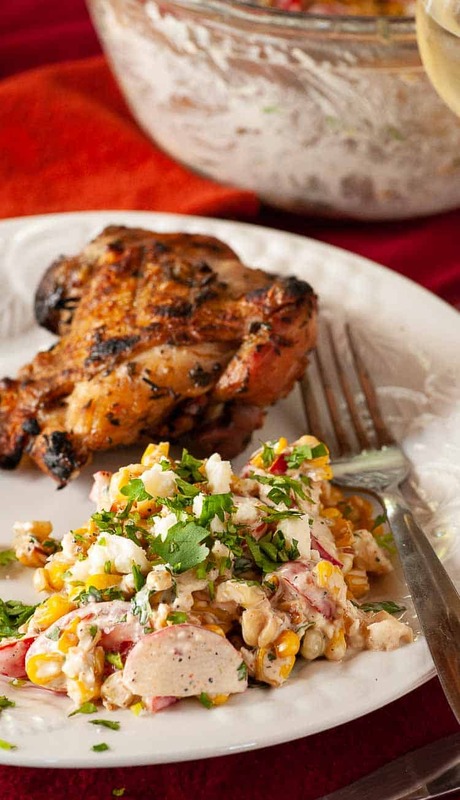 Try Mexican street corn salad next time you’re grilling out. And try my Chicken Brining recipe too. 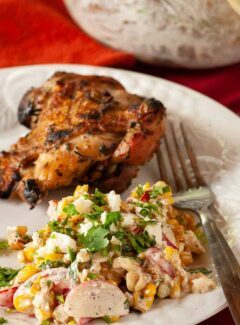 Charred, grilled corn kernels mixed with grape tomatoes and radishes with a delicious, spicy dressing. Sure to become a summer favorite salad. Add vegetable oil, onions and corn to a hot skillet and cook, stirring occasionally until the corn is starting to char, 10 to 15 minutes. Add the garlic at the end of cooking and stir in. (A cast iron skillet works best). Place the corn into a large bowl to cool. Once slightly cooled, add the tomatoes, radishes and cilantro. Serve warm or at room temperature with extra cheese and cilantro if desired.